A lady desiring vengeance seeks a highwayman’s help in this tale by an author whose novels are “the gold standard in historical romance” (Lisa Kleypas). Lady Leigh Strachan’s father governed the town of Felchester—until a religious zealot murdered her family and turned the village into hell on Earth. Now, there is room in her heart for only one thing: revenge. Leigh plans to kill her father’s murderer once she learns to aim a pistol, slash a sword, and ride a horse. She seeks out the Prince of Midnight, a legendary highwayman exiled to France, as her choice of tutors. But the man she finds in a crumbling French castle is no hero. Half deaf and suffering from vertigo, S. T. Maitland can scarcely walk, much less wield a sword atop a dancing stallion. Yet for reasons she can’t explain, she remains with him, steeling her heart against the sight of his gold-streaked hair, green eyes, and brows adorned with a devilish curl at the arch . . .
Women mean nothing but trouble to the highwayman, so he wishes Leigh were less alluring. Alas, she is beautiful, with a piercing gaze and a determined spirit. Despite his broken balance, the loss of his horse, and the price on his head, he vows to return to England with her. He cannot resist the challenge—or the chance to sacrifice everything for love . . . 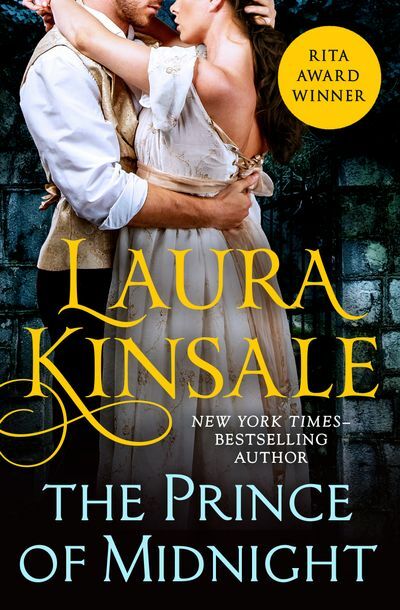 The New York Times–bestselling author of Flowers from the Storm and Shadowheart, Laura Kinsale writes an “unfailingly brilliant and beautiful” romance (Julia Quinn).